Trafalgar Square is one of the most popular areas of London to visit. With its historical significance, being the meeting point of the City of London and the City of Westminster, and with many major tourist attractions surrounding it, it is no wonder it is so popular! 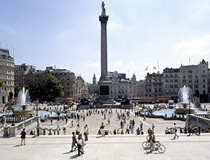 At the centre of the square is the 52m high Nelson's Column with four lions surrounding it. In each corner are statues, except in the northwest corner. This is known as the fourth plinth and displays a different piece of artwork for a certain length of time. The square regularly hosts celebrations which can be attended by all members of the public. It is also renowned as a site of many protests and public demonstrations for many different causes. Not long ago, the square used to be very famous for its pigeons, however the banning of the sale of pigeon food and the outright ban of feeding the pigeons has now reduced the number of pigeons hugely.